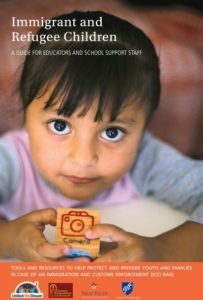 This guide was created for educators, school support staff and service providers who teach, mentor and help open the doors of opportunity for undocumented youth and unaccompanied and refugee children currently living in the United States. Educators, school support staff and service providers are often the first individuals a student and/or family comes out to as undocumented. Moreover, they are often the first ones to witness the impact of increased enforcement measures on students and their families. It’s critically important that educators, school support staff and service providers know the tools and resources available to help protect and prepare youth and families for an Immigration and Customs Enforcement (ICE) raid. Download the guide in English or Spanish.